A series of three explosions at Kanlaon on 18 June 2016 sent ash plumes as high as 3 km above the crater and caused minor ashfall in neighborhoods W, SW, and NW of the volcano (BGVN 42:01). This was followed by steam plumes through 25 July 2016. The active Lugud crater (figure 4) has been the source of 21 reported eruptions since 1969; the latest eruption took place in December 2017. Information summarized here for activity from September 2016 through December 2017 was provided by the Philippine Institute of Volcanology and Seismology (PHIVOLCS). Figure 4. 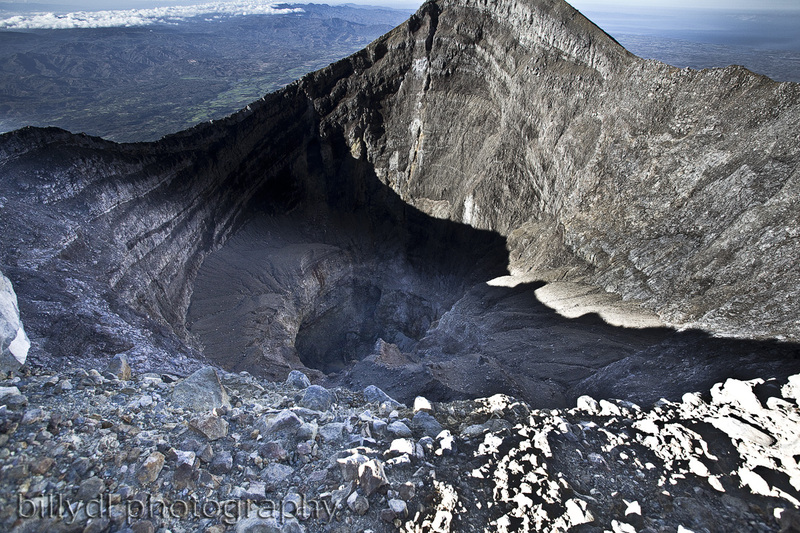 Photo looking down from the rim into the historically active Lugud crater at Kanlaon on 7 March 2010. Courtesy of Billy Lopue, used under Creative Common BY-NC-ND 2.0 (https://creativecommons.org/licenses/by-nc-nd/2.0/). PHIVOLCS reported on 5 May 2017 that since the last phreatic eruption in June 2016 there had been a general decline in activity: seismicity was at baseline levels, no significant deformation had been detected since August 2016, sulfur dioxide emissions were low, and no steaming had been observed since 29 September 2016. The Alert Level was lowered to 0 (on a scale of 0-5), though the public was warned to not enter the 4-km-radius Permanent Danger Zone (PDZ). Between 24 June and 18 August 2017 the seismic network detected 244 volcanic earthquakes. The PHIVOLCS report noted that the increased seismic activity could be followed by phreatic explosions at the summit crater, despite the absence of visible degassing or steaming from the active vent. The Alert Level was raised to 1. The number of daily volcanic earthquakes increased after 18 August. In their 15 November report, PHIVOLCS indicated that during the previous 24 hours there had been 279 deep volcanic earthquakes recorded (compared to five the day before). This prompted them to raise the Alert Level to 2 (moderate level of unrest), where it remained for the rest of the year. The next day, the number recorded was 217. After that the daily number of volcanic events dropped considerably, especially after 21 November. Based on PHIVOLCS reports, the number of daily volcanic earthquakes during the first eight days of December 2017 varied from one to seven. On 9 December an approximately 10-minute-long, low-energy phreatic explosion began at 0947 that was heard as far away as La Castellana, Negros Occidental (15 km SW). A plume of voluminous steam and dark ash rose 3-4 km above the summit vent (figure 5), and minor amounts of ash fell in Sitio Guintubdan (23 km W), and barangays W of the volcano (Ara-al, Sag-ang, and Ilihan). 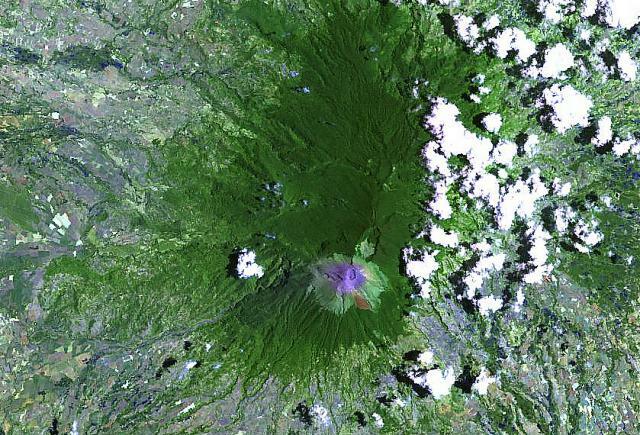 The eruption was preceded by the resumption of degassing at the summit crater at 0634, detectable as continuous low-energy tremor during periods when the summit was not visible; degassing was last observed September 2016. Figure 5. Photo of the 9 December 2017 plume rising from Kanlaon as seen from Barangay Manghanoy, La Castellana, Negros Occidental, about 15 km SW. Photo by Ms. Ritchel Demerin Villanueva; posted by PHIVOLCS on Facebook. Only three volcanic earthquakes were detected on 10 December, but then the number increased to 155 the next day. The number of daily events earthquakes increased again to 578 on 13 December, rose to 1,007 the next day, and peaked at 1,217 on the 15 December. The earthquake count dropped to 149 on 16 December before returning to six or fewer through 19 December. White steam plumes rose 800 and 300 m above the crater on 13 and 14 December, respectively. White plumes were diffuse on 15 December; weather clouds prevented views of the summit area during 16-18 December. Sulfur dioxide emissions were 603-687 tons per day during 13-14 December. PHIVOLCS reported that during 19-20 December there were 412 volcanic earthquakes. A low-energy, explosion-type earthquake was detected at 0233 on 21 December associated with gas emissions from the summit area. Later in the day steam plumes rose 400 m and drifted NE. The number of daily volcanic earthquakes increased to 957 the next day and then decreased to less than 20 per day during 22-23 December. The daily earthquake count increased to 382 and 776 events on 24 and 25 December, respectively, decreased to 82 on 26 December, and the dropped to three or fewer over the last days of the year. Weather clouds often prevented observations , but white plumes rose 300 m and drifted NE, NW, and SW on 21 December, and 700 m on 26 December. A steam plume on 30 December was seen rising 500 m above the crater rim and drifting SW. On 30 December 2017, sulfur dioxide levels were measured at an average of 1,946 tonnes/day. Information Contacts: Philippine Institute of Volcanology and Seismology (PHIVOLCS), Department of Science and Technology, University of the Philippines Campus, Diliman, Quezon City, Philippines (URL: http://www.phivolcs.dost.gov.ph/); Billy Lopue, flickr (URL: https://www.flickr.com/photos/21905294@N03/). PHIVOLCS reported that there were three or fewer volcanic earthquakes detected at Kanlaon each day during 27 December 2017-2 January 2018. Dense weather clouds prevented visual observations, though on 30 December a steam plume was seen rising 500 m above the crater rim and drifting SW. The Alert Level remained at 2 (on a scale of 0-5). PHIVOLCS reported that during 19-20 December there were 412 volcanic earthquakes detected at Kanlaon. A low-energy, explosion-type earthquake was detected at 0233 on 21 December associated with gas emissions from the summit area. Later in the day steam plumes rose 400 m and drifted NE. The number of daily volcanic earthquakes increased to 957 the next day and then decreased to less than 20 per day during 22-23 December; the daily count increased to 382 and 776 events on 24 and 25 December, respectively, and then decreased to 82 on 26 December. White plumes rose 300 m and drifted NE, NW, and SW on 21 December, and 700 m on 26 December; weather clouds prevented views on the other days. The Alert Level remained at 2 (on a scale of 0-5). PHIVOLCS reported between 1 and 7 volcanic earthquakes at Kanlaon were recorded each day during 2-8 December, prior to the phreatic eruption on 9 December. Only three events were detected on 10 December, and then the number increased to 155 the next day. The number of daily volcanic earthquakes increased to 578 on 13 December, rising to 1,007 the next day, and peaking at 1,217 on the 15th. The earthquake count dropped to 149 on 16 December before returning to six or less through 19 December. White steam plumes rose 800 and 300 m above the crater on 13 and 14 December, respectively. White plumes were diffuse on 15 December; weather clouds prevented views of the summit area during 16-18 December. Sulfur dioxide emissions were 603-687 tons per day during 13-14 December. The Alert Level remained at 2 (on a scale of 0-5). PHIVOLCS reported that between 24 June and 18 August the seismic network at Kanlaon detected 244 volcanic earthquakes. The report stated that the increased seismic activity could be followed by phreatic explosions at the summit crater, despite the absence of visible degassing or steaming from the active vent during 2017. The Alert Level was raised to 1 (on a scale of 0-5), and the public was warned to not enter the 4-km-radius Permanent Danger Zone (PDZ). On 5 May PHIVOLCS reported that since the last phreatic eruption at Kanlaon, which occurred on 15 June 2016, there has been a general decline in activity: seismicity was at baseline levels, no significant deformation had been detected since August 2016, sulfur dioxide emissions were low, and no steaming had been observed since 29 September 2016. The Alert Level was lowered to 0 (on a scale of 0-5), though the public was warned to not enter the 4-km-radius Permanent Danger Zone (PDZ). PHIVOLCS reported that during 20-25 July diffuse white plumes rose above Kanlaon; On 20 July plumes were a dirty-white color, and on 25 July they rose 200 m and drifted NW and SW. The Alert Level remained at 1 (on a scale of 0-5). PHIVOLCS reported that during 22-23 and 25-26 June white steam plumes from Kanlaon rose as high as 800 m and drifted NW and SW; wispy steam plumes were observed on 27 June. Starting at 1640 on 23 June the seismic network recorded a 4-minute-long, explosion-type signal; weather clouds prevented visual observations of the summit area. The Alert Level remained at 1 (on a scale of 0-5). PHIVOLCS reported that long-duration tremor began at Kanlaon at 0130 on 30 March. The tremor was accompanied by gas-and-steam plumes that rose 600-700 m and drifted SW and SSW during 30 March-1 April. On 31 March minor ashfall was reported in areas downwind including in parts of La Carlota City (14 km W), La Castellana, and Bago City in Negros Occidental. The tremor continued during 2-4 April, though the energy decreased, and steam plumes rose 400-500 m. On 5 April steam plumes rose 800 m and drifted SW. The Alert Level remained at 1 (on a scale of 0-5). PHIVOLCS reported that at 1820 on 29 March the seismic network at Kanlaon detected an explosion that lasted about 12 minutes. The event was accompanied by a booming sound heard in communities to the W, including Ara-al, Yubo, La Carlota City (14 km W), and Canlaon City (8 km ESE) in Negros Occidental. Observers to the SE reported an ash plume that rose 1.5 km above the crater; minor amounts of ash fell in areas downwind. Incandescent ejecta caused a small bushfire on the upper flank. A 25-second-long explosion was detected at 1918. The Alert Level remained at 1 (on a scale of 0-5). 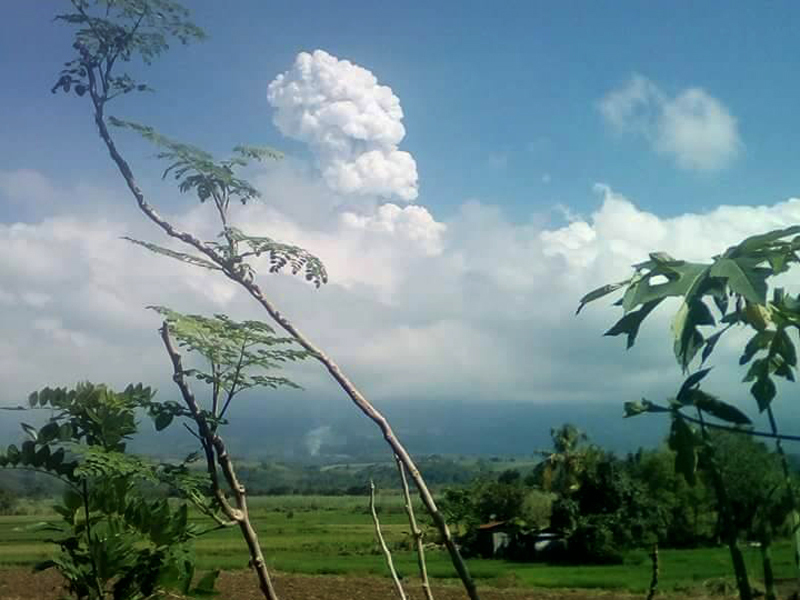 PHIVOLCS reported that at around 1230 on 30 Decemeber a low-energy explosion at Kanlaon, observed by residents in barangays Cabagnaan and Sag-ang in La Castellana (16 km SW), produced an ash plume that rose 100 m above the crater and slowly drifted SW. The Alert Level remained at 1 (on a scale of 0-5). PHIVOLCS reported that at 1457 on 23 December the seismic network at Kanlaon detected an explosion. The event was not visually observed due to dense weather clouds around the summit area but rumbling was heard in nearby barangays including Cabagnaan, La Castellana (16 km SW), and Ara-al and Yubo, La Carlota City (14 km W). Minor amounts of ash fell in Ara-al, Haguimit, and La Granja, La Carlota City, and a sulfur odor was noted in barangay Tres Elis, La Castellana. An explosive event detected by the seismic network at 2109 on 24 December was again not visually observed. Trace amounts of ash fell in Ara-al, Haguimit, and La Granja, and a sulfur odor was reported in Tres Elis. White steam plumes rose 100 m above the crater and drifted SW on 26 December. A five-minute long ash event that began at 1329 on 27 December was accompanied by rumbling heard in a few local barangays. An eruption plume, viewed from the SE flank, rose 1 km above the crater, and may have risen as high as 4.5 km based on pilot observations. Minor ashfall was noted in Ara-al, Yubo, and La Granja, Cabagnaan, Sag-ang (La Castellana), barangay Miranda, Hinigaran (Negros Occidental), Municipality of Pontevedra (Negros Occidental), and reached as far as Nueva Valencia, Guimaras (58 km WNW). The Alert Level remained at 1 (on a scale of 0-5). PHIVOLCS reported that at 2138 on 15 December a low-frequency earthquake at Kanlaon that lasted 45-47 seconds possibly corresponded to an ash emission, though inclement weather prevented visual observations of the crater. Rumbling was heard in neighborhoods on the SE flank. On 17 December white steam plumes rose 50 m above the crater. Poor weather conditions prevented views of the crater through 22 December. PHIVOLCS reported that two volcanic earthquakes at Kanlaon were accompanied by a one-minute, low-energy, gray ash emission at 0513 on 11 December. Observers noted ash emissions at 0951, 1008, 1140, and 0101 on 13 December which rose 200-300 m and drifted SW. The emissions were not detected by the seismic network, indicating a shallow source. Trace amounts of ashfall were reported in Sitio Bais, Brgy Yubo, and La Carlota City on the W flank and Brgy Sag-ang and La Castellana on the SW flank. The Alert Level remained at 1 (on a scale of 0-5). PHIVOLCS reported that the seismic network for Kanlaon detected 11 volcanic earthquakes during 24-25 November. Emissions of gas and ash rose 150 m above the crater and drifted SW on 25 November. The Alert Level remained at 1 (on a scale of 0-5). PHIVOLCS reported that the seismic network for Kanlaon detected an explosion-type signal beginning at 0930 on 23 November, culminating with an 8-minute-long steam explosion. Observers reported that a white plume rose 1-1.5 km above the crater and drifted SW, and rumbling was heard in local areas. Only four volcanic earthquakes had been recorded during the previous week, but after the explosion, the network detected volcanic tremor that lasted for five hours. The Alert Level was raised to 1 (on a scale of 0-5). Continuous steam emissions with minor ash content were observed the next morning. PHIVOLCS reported that during 23 August-1 September the seismic network for Kanlaon detected a significant rise in the number of earthquakes. A few of the earthquakes were felt as far away as Bago City, 30 km NW. The epicenters clustered on the NW flank. According to news articles, PHIVOLCS lowered the Alert Level for Kanlaon to 0 on 25 April. Seismic activity was at background levels during 5 March-25 April, with 0-3 earthquakes per day. Mt. Kanlaon Natural Park opened for mountaineering activities; however visitors were warned that the risk of entering the 4-km permanent danger zone remained high. PHIVOLCS reported that during 7-10 February the seismic network for Kanlaon detected a significant rise in earthquakes. On 10 February the Alert Level was raised from 0 to 1 (out of 5). Cloud cover prohibited visual observations of the summit. The public was strongly advised not to enter the 4-km Permanent Danger Zone. On 2 November, PHIVOLCS reported the lowering of the Alert Level for Canlaon from 1 to 0. During 26 July-2 November, no ash explosions occurred and steam emissions and seismicity were low. Based on interpretations of seismic data, an explosion at Canlaon that lasted more than 10 minutes occurred on 23 July. An ash column was not observed due to cloud cover. Trace deposits of ash fell up to 9 km ENE of the crater in the neighborhoods of Pula, Malaiba, and Lumapao. On 24 July, PHIVOLCS reported a total of 16 volcanic earthquakes, 3 short-duration tremors, and 2 earthquakes indicating small explosions. Ash was not observed. Minor steam-and-ash emissions that were observed from Canlaon during 21-24 June reached a maximum height of 1.5 km above the summit (12,900 ft a.s.l.) and drifted NW and SW. Light ash fall was observed approximately 25 km SW in the municipality of La Castellana. The alert status remained at Level 1, which restricts activity within 4 km of the summit. Minor steam-and-ash emissions that were observed from Canlaon during 13-15 June reached heights of 2 km above the summit (14,600 ft a.s.l.) and drifted primarily NE and NW. Light ashfall was observed on the volcano's upper N flanks and reached approximately 10 km E in Canlaon City. The alert status remained at Level 1, which restricted activity within 4 km of the summit. Small explosions on 3, 10-11, and 12 June generated steam-and-ash emissions from Canlaon that reached maximum heights of 1 km above the summit (11,300 ft a.s.l.) and drifted NW and SW. Ash fell on the upper SW slopes during 10-12 June. The alert status was raised on 12 June to Alert Level 1 (scale 0 to 5), which restricts activity within 4 km of the summit. Steam emissions continued at Canlaon during 25-26 May, rising to a maximum height of 1 km above the volcano's crater (11,300 ft a.s.l.). Seismic activity remained at low levels. The sulfur-dioxide flux was at ~1,400 metric tons on 26 May, above the usual flux of 500 metric tons per day. Phreatic activity continued at Canlaon during 18-23 May, with ash-and-steam plumes rising to ~1 km above the volcano (~11,300 ft a.s.l.). This activity was not recorded in seismic data. The sulfur-dioxide flux on 22 May was at ~2,080 metric tons per day, much higher than the normal flux of 500 metric tons per day. Canlaon remained at Alert Level 1, with a 4-km Permanent Danger Zone around the summit off limits to visitors. Multiple episodes of mild ash and steam ejections were observed at Canlaon during 10-11 May that sent clouds to heights of up to 500 m above the vent before being blown NW. These episodes were not seen in the seismic record. The hazard status remained at Alert Level 1. Contingency plans formulated earlier this year by local governments in consultation with PHIVOLCS in the event of a major eruption were misinterpreted in press reports indicating that evacuations were being recommended. The current level of activity does not require any evacuation or facility closures. Ongoing ash emissions are only a concern on the upper slopes of the volcano within 4 km of the summit crater. Regular mild ash-and-steam clouds rising less than 800 m above the crater did not cause ashfall in local communities during 3-10 May. During 27 April to 2 May, mild ash-and-steam emissions from Canlaon produced plumes to a maximum height of 1 km above the volcano (11,300 ft a.s.l.). The sulfur-dioxide flux began to increase on 28 April, reaching 2,700 tons on 1 May. According to news reports, flights to and from nearby Kalibo airport were suspended on 3 May due to reduced visibility. Mild ash eruptions continued at Canlaon during 21-26 April, producing plumes as high as 1 km above the volcano (11,300 ft a.s.l.). Emissions on 21 April drifted SW and deposited small amounts of ash in the villages of Sagang, Mansalanao, Old Fabrica, Biak-na-Bato, Kamandag, Tinago, and Cabagnaan of the town La Castillana. Emissions on 22 April deposited ash in Manghanoy and Cabagnaan. Emissions on 25 April deposited traces of ash in Canlaon City. Canlaon remained at Alert Level 1 (on a scale of 0-5). During 13-14 April, mild ash emissions at Canlaon produced plumes to a height of ~700 m above the crater (~10,300 ft a.s.l.). During 15-17 April, moderate-to-strong emissions produced ash plumes to ~2 km above the crater (~14,600 ft a.s.l.) and deposited ash in villages as far as La Castellana (16 km SW of the crater). Canlaon remained at Alert Level 1 (on a scale of 0-5). A low-energy ash emission from Canlaon on 7 April at 1429 generated a cloud to a height of ~100 m above the crater (~8,300 ft a.s.l.). The cloud slowly drifted SW. Only the crater and upper SW slopes of the volcano were affected by the emission. According to PHIVOLCS, the seismic monitoring network around the volcano did not record any earthquakes during the event. Canlaon remained at Alert Level 1. Ash emissions began from Canlaon on 20 March around 1300. Small amounts of ash fell in the town of Guintubdan 5 km W of the volcano. During 24 March to 4 April, sporadic ash emissions rose to a maximum height of 1 km above the volcano (11,300 ft a.s.l.). During this time ash fell in the towns of La Castellana (16 km SW of the crater), Upper Sag-ang, Yubo (5-6 km SW), and Guintubdan (5-6 km WNW). Due to this low-level episode of unrest, PHIVOLCS raised the Alert Level at Canlaon from 0 to 1 on 30 March. There was also a 4-km-radius Permanent Danger Zone around the volcano's summit. According to a news article, pilots were advised to avoid flying near Canlaon. A brief ash emission began at Canlaon around 0930 on 21 January. The cloud produced from the emission rose to an approximate height of 500 m above the active crater and drifted WNW and SW. No coincident volcanic earthquakes were recorded. There were fine ash deposits in the city of Cabagnaan, ~5.5 km SW of the crater. PHIVOLCS advised the public to avoid entering the 4-km-radius Permanent Danger Zone around the volcano. On 1 March PHIVOLCS reduced the Alert Level at Canlaon from 1 to 0, due to low seismicity and volcanism. After September 2003, either no activity or weak steam emissions were observed at the summit crater and seismicity was at normal levels. The public was advised that there was still a risk of sudden phreatic explosions occurring in the 4-km Permanent Danger Zone. An emission from Canlaon on 10 July at 1735 sent an ash-and-steam cloud to a height of ~1 km above the summit. The cloud was visible from Canlaon City and drifted NW, SW, and NE, depositing ash in an area within a 4 km radius around the crater. Emissions also occurred on 11 July during 0620-0624 and 0658-0705 that rose to ~1.3 km above the crater and drifted SE. Canlaon remained at Alert Level 1, with a 4-km-radius Permanent Danger Zone. As of 4 July, moderate steam-and-ash emissions continued at Canlaon, with ash columns reaching ~900 m above the summit. Low-frequency volcanic earthquakes and low-frequency short duration harmonic tremor were recorded. According to PHIVOLCS, based on Canlaon's historical behavior the mild phreatic activity that is occurring is probably related to hydrothermal disturbances at shallow depths. The absence of longer duration harmonic tremors suggested no active magma movement or intrusion. However, sudden ash emissions and explosions are still expected to occur anytime without warning. Canlaon remained at Alert Level 1 (on a scale of 0-5). On 17 and 18 June multiple small emissions occurred at Canlaon. On the 17th and on the morning of the18th ash-and-steam plumes rose to a maximum height of ~400 m above the volcano and drifted NE. On the afternoon of the 18th plumes drifted SE. Low-frequency volcanic earthquakes were recorded prior to the eruptions. Canlaon remained at Alert Level 1 (on a scale of 0-5), with a 4-km-radius Permanent Danger Zone. According to a news article, an ash emission occurred from Canlaon on 8 June during 0645-0700. Small amounts of ash fell in Canlaon City, Barangay Masulog, and Barangay Linutangan. In addition, PHIVOLCS recorded several low-frequency volcanic earthquakes and short-duration harmonic tremor. Moderate steaming occurred, which was above normal levels. The Alert Level at Canlaon remained at 1 (on a scale of 0-5), with a 4-km-radius Permanent Danger Zone. A small ash puff was released from Canlaon on 28 November at 0721. The puff rose to a height of ~100 m above the active crater and drifted SW. Associated volcanic tremor was recorded at Cabagnaan and Guintubdan stations. Traces of ash fell at Cabagnaan station, SSW of the active crater. Moderate steam emissions were observed immediately after the ash puff and a few discrete tremors were recorded. PHIVOLCS advised the public to remain outside of the 4-km-radius Permanent Danger Zone. During early February, high-frequency earthquakes were recorded at Canlaon at depths of 1-5.5 km. In the previous week, several low-frequency earthquakes were recorded. According to a news report, PHIVOLCS stated that the occurrence of low-frequency earthquakes supports the idea that some fluid migration, possibly magma ascent, is occurring. The Alert Level remained at 1 ("Low-level unrest"), and a 4-km-radius Permanent Danger Zone was in effect. PHIVOLCS noted in a 21 March report that since January 2001 earthquake clusters or occurrences have been recorded by the seismic monitoring network around the volcano. These earthquakes may signify a reactivation of the volcanic system at depth and could be a precursor to more vigorous activity, such as ash explosions. This interpretation is based on similar earthquake clusters manifested prior to the 10 August 1996 phreatic explosion from the active summit crater of the volcano. In view of the possibility of a sudden ash ejection, PHIVOLCS recommends the immediate suspension of all treks to the summit crater until further notice. As an additional precaution, the pre-defined 4-km-radius Permanent Danger Zone (PDZ) should be avoided at all times. The following cable was received from the American Embassy in Manila. "Canlaon Volcano on Negros Island erupted 2200 on 11 October (local time). Activity was ash eruption only. Present activity slight emission of white steam. No lava flow observed. Eruption consisted of ash laden clouds, air shock manifested during eruption. Ash deposited on W slope of volcano." The following report is from Father Hennessey. "Canlaon . . . erupted at 2205 local time, 11 October 1969. An earthquake was felt in the vicinity. A mild ejection of ashes on the western slope; eruption cloud of white smoke for 25 minutes; no report of molten lava; very little change in physical and biological environment. Present activity is quiet." The following is from the "Manila Times" on 16 October 1969. "A 35-hectare area caved in last night in barrio Malawig at the foot of the Canlaon Volcano after it erupted at 1725 yesterday. Red Cross Director Dr. Mariano Beltran reported that an accumulation of sulfuric sands blocked a road in barrio Biak-na-bato of this town which links Negros Occidental to Negros Oriental. The mudflow menace persisted yesterday over Canlaon Volcano in Negros as heavy rains turned heay deposits of ashes on its upper slopes into new rivers of mud. Rogelio Datuin, supervising volcanologist, said that the volcano's activity has returned with no seismic disturbance recorded during the past 24 hours." The following is from the "Manila Times" on 11 October 1969. "Canlaon Volcano is an andesitic volcano and no violent eruptions are recorded, but ash has been ejected from time to time, and characterized further by continuous emission of vapor of sulfur dioxide under high temperature." Information Contacts: Card 0792 (14 October 1969)Mr. Bryoade, American Embassy, Manila, Philippines; Father Hennessey, Manila Observatory, Manila, Philippines. Card 0798 (21 October 1969)The Manila Bulletin, Manila, Philippines; The Manila Times, Manila, Philippines; J.J. Hennessey, Manila Observatory, Manila, Philippines. A brief ash eruption began at  on 27 June. A grayish eruption column rose [~1,500 m] above the summit before being blown S by strong prevailing winds. Ash fell on S-flank villages within 8 km of the summit. The eruption ended after about 20 minutes, and was succeeded by voluminous but low-pressure emission of white vapor. Information Contacts: G. Andal, Commission on Volcanology (COMVOL), Quezon City. Intermittent ash emission continued through July. The most recent ash emission occurred at 1253 on 31 July when a brownish column rose 700 m above the crater, accompanied by volcanic tremor. Further Reference. Oanes, A., 1978, 1978 Canlaon volcano eruption: COMVOL report (unpub.). COMVOL reported that an average of 60 earthquakes/day were recorded near Canlaon in mid-May, reaching a maximum of 160 on 17 May [but see 5:6]. COMVOL installed three additional seismic stations around the volcano and extended the danger zone from 4 to 10 km. A similar earthquake swarm preceded the 1978 eruption. An earthquake swarm began 6 May in the vicinity of Canlaon. The number of earthquakes recorded per day on nearby seismographs reached a peak of 108 on 19 May, then seismicity began a gradual decline. In late June, volcanic shocks continued to occur at a rate of about 40/day. As of 27 June, a total of 2,652 events had been recorded. No surface volcanism has been reported with this earthquake swarm. Information Contacts: O. Peña, COMVOL, Quezon City. Seismic activity has lessened considerably, but remained above normal as of late November. A small steam and ash eruption 13-14 March was preceded by local seismic activity. Three high-frequency volcanic tremors were recorded on 9 March and one each on 10, 11, and 12 March by a PHIVOLCS seismograph 9 km from the vent. Sustained seismic activity started suddenly on 13 March at 1312, 4.5 hours before the onset of the eruption, and totaled 139 recorded events, 60 of which were high-frequency and 79 low-frequency types. At the beginning of the seismic crisis, only high-frequency tremors were recorded, then low-frequency types predominated between 1400 and 1600. The number of events per minute declined before the eruption began. Mild ejection of steam with a minimal amount of ash started 13 March at 1745, producing a plume that reached 300-500 m height. At 1515 the next day, the summit was steaming voluminously, and the vapor column rose 500-700 m. On 15 March at 1700, "moderate" steaming was reported. The volcano was cloud-covered and only occasionally visible. During the eruption's first 24 hours (until 14 March at 1759) 51 high-frequency and 9 low-frequency tremors were recorded. Information Contacts: PHIVOLCS, Quezon City. On 5 October a small eruption produced an 800-m eruptive cloud, depositing ash on four nearby villages. A strong booming sound was reported to have preceded the eruption and earthquakes were felt during the eruption. Activity had declined to voluminous emission of white vapor on 8 October and weakened further the next day, but seismographs continued to record low-frequency events. PHIVOLCS declared a 4-km-diameter danger zone two weeks before the eruption, and residents of the zone were ordered to evacuate when the eruption began. Without any preceding seismic activity, Canlaon weakly ejected ash on 3 June at 0139. Ash reached a height of ~ 300 m above the crater rim before drifting NE. The ejection was accompanied by audible rumbling and an explosion earthquake felt at intensity I, 5.5 km SE of the crater (at Barangay Pula). The event lasted 15 minutes, 45 seconds. Another explosion earthquake, with 18 mm amplitude, occurred at 0435; it lasted 55 seconds. From 0436 to 0500 there was moderate to voluminous emission of dirty white steam, reaching a height of 300 m and drifting NW. Ash deposits were confined to 200 m from the crater on the SE and NE slopes. Canlaon again erupted on 21 June, almost 19 days after the previous ash ejection. The event started at 1907 and was characterized by a cauliflower-shaped ash-steam cloud that rose to 4,000 m above the volcano's 2,465-m summit. The event was initiated by an explosion-type earthquake felt with intensities III and II at seismic stations 6 and 8.7 km from the summit respectively (Cabagnaan and Canlaon). Booming and hissing sounds accompanied the ash ejection. A strong sulfurous odor was detected at Canlaon station a few minutes after the event. Field investigation the next morning showed that light ashfall had occurred on several villages SE of the summit. The maximum thickness of the wet, rainsoaked ash deposit 4.5 km from the summit was 2 mm. The maximum volume of ejected material was 136,600 m3. The eruption was anticipated because of the marked increase in steam volume 10 days prior to the eruption. The number of low-frequency volcanic earthquakes had remained at a high level after the ash ejection of 3 June and decreased slightly 9-13 June. Seismicity increased again on 14 June, 8 days earlier. As of 1 July, seismicity and steaming had decreased slightly. PHIVOLCS noted that other ash ejections are still to be expected based on the eruptive patterns of 1969, 1978, and 1985. Furthermore, PHIVOLCS noted that the continued presence of low-frequency harmonic tremor, not recorded in the past at this volcano, heightens the possibility of magmatic eruption. Information Contacts: R.S. Punongbayan, PHIVOLCS. Increased seismicity and thermal activity were followed by a small ash eruption. On 30 March the number of volcanic earthquakes reached 9/day, an increase from the previous level of 1-3/day. Seismicity continued at moderate to low levels until 22 April when 74 low-frequency volcanic events were recorded and steam emission increased. Steam plume height increased to 150-200 m from a normal of 50-100 m, and 40-50% of the vent opening was filled with steam. PHIVOLCS officially informed the Secretary of Science, Department of Science and Technology that the condition of the volcano was unstable but since no harmonic tremor was being recorded, only a mild ash ejection was expected if activity increased. On the morning of 24 April a fresh ash deposit ~1-2 km wide and 6.5 km long extended down the SW flank. No eruption signals were recorded by seismometers and no sounds were heard by nearby residents. A sulfur smell was reported from the Cabagnaan Observatory (approximately 6 km SW of the crater) on the same day. Geochemical studies of the Mambucal aquapool, mudpool, and sulfur spring (9.5 km NNW of the summit) showed increasing sulfate and chloride concentrations starting 19 February. The ash eruption that occurred 23 or 24 April was preceded by a steady increase in sulfate concentration in the Mambucal aquapool, mudpool, and sulfur spring. The increase began on 19 February when the average sulfate concentration rose from 40 ppm to 89-106 ppm in the aquapool, from 200-364 ppm to 490-708 ppm in the mudpool, and from 100-149 to 356-436 ppm in the sulfur spring (figure 1). Chloride concentration in the aquapool had ranged from 1,682-1,826 ppm but values began fluctuating between 1,870-2,130 ppm on 15 March. No corresponding change in chloride concentration was noted in the mudpool or sulfur spring. Thermal measurements in the Mambucal probe hole, aquapool, and sulfur spring yielded anomalous results but increases of 1.0°, 3.0°, and 5.0° C respectively (compared to the readings of the last quarter of 1986) were noted. Figure 1. Sulfate concentration at Mambucal Aquapool, Mudpool, and Sulfur Spring, 9.75 km NNW of Canlaon's summit, 1 January-4 April 1987. Courtesy of PHIVOLCS. Geodetic measurements on 28-29 April revealed a slight inflation of 2.61 mm along a 400-m levelling line on the SE flank. Seismicity began increasing on 30 March 1987 and reached 74 low-frequency events on 22 April (see figure 2 and 12:4). Figure 2. Number of low-frequency volcanic earthquakes at Canlaon, 1 January 1986-29 April 1987. Courtesy of PHIVOLCS. Further Reference. Bautista, L.P., 1987, Volcano Update - Canlaon Volcano; Phivolcs Observer, v. 3, no. 2, p. 5. A series of ash ejections began on 21 June. During the initial outburst from 1725 to 1740, light-grayish steam clouds rose to a maximum height of 300 m above the crater. Traces of ash were noted at the village of Mananawin on the SE slope at 980 m elevation. This event was not recorded by the flank seismic network. Previous ash ejections in April 1987 were similarly not recorded (12:4-5). Ash ejections ocurred again the next day at 1230 and 1418 and were recorded as small-amplitude (0.5 mm) harmonic tremors with durations not exceeding 2 minutes. The maximum ash cloud height was 600 m above the crater. Sulfur stench was noted by SE flank residents. On 24 June, ash ejections occurred at 1155 and 1455, accompanied by faint rumbling sounds. Ash from the 400-m-high eruption clouds was deposited on the upper SE slopes. No eruption signal was recorded by PHIVOLCS seismic stations. Another ash ejection occurred at 1105 on 27 June, accompanied by an explosion-type earthquake that had a maximum double amplitude of 4.0 mm and lasted for 1 minute. As observed from the Canlaon Volcano Observatory (8.7 km SE of the crater), the cloud rose 500 m above the crater and deposited ash along the SW upper slopes. Background seismicity varied from 5 to 18 events/day following the first outburst. Steam emission between ash ejections covered 20-50% of the crater's area. Since the ash eruption of April 1987, slight inflation of the SE flank and moderate seismicity have occurred (12:4-5). Further Reference. Sincioco, J., 1988, The 1988 Eruptive Activity of Canlaon Volcano; Phivolcs Observer, v. 4, no. 3, p. 3. Since 25 October, mildly explosive ash ejections, to as much as 1,200 m above the summit, have occurred almost daily. As of 3 November, 29 voluminous gray plumes had deposited ash over the entire crater area and the upper SW and S slopes. No significant seismicity preceded emissions, which were accompanied by small-amplitude explosion earthquakes and tremor episodes. Iseismicity;explosion earthquake Total sulfate concentrations of hot springs NW of the crater have increased since March, from 90 to 135 ppm in the aquapool, 300 to 365 ppm in the mudpool, and 180 to 250 ppm in the sulfur spring. Mild ash ejections occurred almost daily at Canlaon in the 5 weeks since eruptive activity began on 25 October at 1230. A total of 79 ash ejection episodes have been documented, the most recent on 1 December from 0515 to 0737. Plumes generally reached 200-1200 m above the summit (the highest on 3 November) and were dispersed as far as 8-10 km S. The ash plumes emitted during activity 15-17 November and 1 December covered ~80% of the crater area, compared to 100% for the larger eruptive episodes. Ground deformation measurements showed slight inflation of the edifice a few hours before ash ejections, most of which were accompanied by small-amplitude explosion earthquakes and short-duration harmonic tremor. Between eruptive episodes, moderate amounts of white steam covered ~20-40% of the crater, and seismic levels fell to 5-10 volcanic events/day. Activity remained weak and PHIVOLCS did not recommend evacuation. As of 13 December, ash plume heights and steam volume had decreased, but not to pre-eruptive levels. Average plume dispersals had also decreased from 0.5-1 km to 50-100 m from the summit. PHIVOLCS noted that although activity appeared to be waning, the volcano's status remained abnormal. Mild ash emission occurred from Canlaon on 8 January  from 1405 to 1426. The light-gray ash clouds rose 600-800 m above the crater before drifting SW. Ashfall was confined to the upper flanks. During the ash emission, the seismograph at Canalon City Observatory recorded short-duration harmonic tremor with a maximum double amplitude of 10 mm, and 15 volcanic earthquakes. Seismic activity then gradually decreased; 8 volcanic earthquakes were recorded shortly after the eruption, but only two small volcanic events were detected between 1600 and 0600 the next morning. Steam emission also gradually decreased from voluminous (filling 80% of the crater) to moderate (40% of the crater filled). As of 12 January, activity was characterized by weak to moderate white vapor emission, with plume heights of 50->100 m and vapor filling 20-40% of the crater. Prevailing winds carried the plume SW and SSW. Seismic activity had remained at background levels (<5 events/day) from 15 February 1991 through the day before the eruption, and pre-eruption steam emission varied from wispy to weak. Geologists believe that the eruption was triggered by ground water suddenly contacting hot rock beneath the summit crater. A PHIVOLCS quick-response team left for Canlaon on 9 January. They issued no recommendation for evacuation, but advised residents of the area not to venture within the previously delineated danger zone (5 km radius) and to heed precautionary and safety measures. Newspapers reported a 1-km-high ash emission and ashfall at flank towns on 10 June, coinciding with a minor earthquake. There were no reports of injuries. People living in the vicinity of the volcano were advised to not enter the 4-km-radius permanent danger zone following a mild phreatic explosion at 0519 on 25 August that produced a voluminous gray steam cloud to 800 m height before drifting NNE. Steaming from the summit area increased following the explosion, and later that morning (0600-1045) a dirty white steam plume rose to heights that varied from 200 to 500 m. Moderate steam emission to 100-200 m was observed in the afternoon and evening. Radio reports stated that ash fell as far away as Panay Island, about 65 km W. Harmonic tremor was detected for 20 minutes during the eruption by a seismometer at Cabagnaan Station, 5.5 km SW of the summit, and an earthquake accompanied by rumbling sounds was felt at the station at 0526. The seismometer also recorded 21 low-frequency volcanic earthquakes within 3 hours after the explosion. Seismicity then rapidly declined, with only two high-frequency and three low-frequency events recorded from 1200 on 25 August through 0500 the next day. Seismicity prior to the explosion was at normal background levels of 0-2 events/day. Canlaon had another mild phreatic explosion at 2329 on 3 September, which lasted for 8 minutes and produced a grayish steam-and-ash column that rose 1,000 m above the summit before drifting SSW and SSE. Traces of ash fell at the Canlaon Volcano Observatory, 8 km SSE of the summit. The phreatic explosion was accompanied by an earthquake felt at the Cabagnaan Station. Moderate-to-strong emission of dirty white steam was observed for 6 hours after the explosion; steaming activity then declined and the steam became white. Increased seismicity was noted during the explosion along with strong steaming, similar to previous phreatic activity at the volcano. Seismicity returned to background levels the next day. EDM surveys conducted after the 3 September event did not indicate significant inflation. Petrographic examination of the ash deposited by the 25 August and 3 September explosions indicated no juvenile component. Information Contacts: R. Solidum, PHIVOLCS; AP. On 10 August at 1431 an ash ejection killed three hikers and emitted a dirty-white steam-and-ash plume to 1,500 m above the central summit crater. The ash ejection lasted ~24 minutes, based on seismic records. A small associated explosion-type earthquake (22.8 mm of amplitude) was detected at the PHIVOLCS Cabagnaan seismic station, 5.5 km SW of the volcano. The ash drifted NE and was observed at altitudes of 7.6 and 11.3 km by Qantas aviators. The Bureau of Meteorology in Darwin issued a volcanic ash advisory describing the plume as extending 110 km SW. PHIVOLCS established a Level 1 alert (low level of hydrothermal disturbance, without any indication of magmatic activity), but no evacuation was advised. PHIVOLCS promptly warned the public to stay outside the 4-km-radius permanent-danger buffer zone. Based on previous Canlaon ash ejections, which were clustered in time, it was judged that there could be more explosions without any additional precursors. After the ash ejection, moderate emissions of white to dirty-white steam rose 100-150 m before drifting NE. On 11 August more white steam emissions were noted between 0353 and 0500. Another aviation notice reported the plume drifting SW. The Cabagnaan seismograph recorded a total of 23 low-frequency volcanic earthquakes and four tectonic earthquakes from 0600 on 11 August through 0600 on 12 August. During 12 August, a quick response team from PHIVOLCS had installed four seismographs and was monitoring ground deformation. The team was also planning to determine the extent of the ash deposit. According to 11 August news reports, two mountaineering groups were present on the summit at the moment of the explosion: a group of ten students from a Belgian University and their seven Filipino guides, and two British visitors accompanied by two local guides. Three people, one British and two Filipino, were killed. Seven Belgians and four Filipinos were evacuated or managed to make it off the mountain before darkness halted rescue efforts, but the other survivors were not rescued until the next morning. Some of the 18 survivors were hospitalized because of injuries caused mainly by falling ejecta. Belgian Caroline Verlinde told reporters that she was descending from the crater rim when the eruption began without warning. She said she had seen a plume of smoke but her guide reassured her that it was normal. "Suddenly it spewed ash and stones. I hid behind a tree but my friends had nothing to protect them. I saw stones falling on them," she told the reporters. Information Contacts: Philippine Institute of Volcanology and Seismology (PHIVOLCS), Department of Science and Technology, 5th & 6th Floors, Hizon building, 29 Quezon Avenue, Quezon City, Philippines; Bureau of Meteorology, Northern Territory Regional Office, P.O. Box 735, Darwin, NT 0801, Australia; Agence France Presse (AFP); Reuters Limited. During January through March 2001, earthquake clusters were recorded by the seismic monitoring network around Canlaon. Similar activity occurred prior to the 10 August 1996 phreatic explosion from the active summit crater of the volcano (BGVN 21:07), leading the Philippine Institute of Volcanology and Seismology (PHIVOLCS) to believe that the earthquakes could signify a reactivation of the volcanic system at depth, a precursor to more vigorous activity such as ash explosions. On 21 March, a PHIVOLCS advisory of possible forthcoming activity recommended the immediate suspension of all treks to the summit crater. In addition, the 4-km-radius Permanent Danger Zone (PDZ) became off-limits at all times. Beginning 28 March through at least 31 May, earthquakes averaged only about 1-2 events per day, a low level of seismicity. Accordingly, PHIVOLCS relaxed its no-entry advisory but urged visitors to avoid entering the crater because explosions could still occur without warning. For the same reason, the public was reminded that no permanent human activity is permitted within 4 km of the crater. No further reports were issued through at least October. Information Contacts: Philippine Institute of Volcanology and Seismology (PHIVOLCS), Department of Science and Technology, 5th & 6th Floors, Hizon building, 29 Quezon Avenue, Quezon City, Philippines; Bureau of Meteorology, Northern Territory Regional Office, P.O. Box 40050, Casuarina, NT 0811, Australia. As of late May 2001, seismicity at Canlaon was low, and the Philippine Institute of Volcanology and Seismology (PHIVOLCS) relaxed its no-entry advisory into the crater (BGVN 26:10). No further reports were issued through 2001. On 30 January 2002 PHIVOLCS reported that during the previous month, the seismic network around the volcano detected a higher number of earthquakes, observations that may indicate a reactivation of the volcano. Seismicity was dominated by high-frequency earthquakes located around the crater, from shallow depth to 8.5 km deep. These earthquakes may represent episodes of subsurface fracturing due to magma intrusion. During mid-January, PHIVOLCS further noted the occurrence of several low-frequency earthquakes, which supports the idea that some fluid migration, possibly magma ascent, was occurring. PHIVOLCS noted that if this idea was confirmed by forthcoming surveys, then the Alert Level may be raised. Increased activity at Canlaon was recognized as early as January 2001 with occurrences of earthquake clusters. At the time PHIVOLCS issued a similar notice but activity quieted down. This year's reactivation seems more intense in terms of the number of earthquakes. They could foretell of impending phreatic eruptions. Several teams were sent to augment the Canlaon Volcano Observatory with additional seismometers and deployment of a GPS-based ground-deformation monitoring network. Because sudden phreatic or steam-driven explosions may occur at any time, PHIVOLCS urged the public to strictly observe the 4-km-radius Permanent Danger Zone (PDZ) around the volcano and recommended the suspension of all treks within this zone until further notice. As of 30 January, PHIVOLCS reported that volcanic activity did not require any kind of evacuation except for areas within the PDZ. Information Contacts: Philippine Institute of Volcanology and Seismology (PHIVOLCS), Department of Science and Technology, 5th & 6th Floors, Hizon Building, 29 Quezon Avenue, Quezon City, Philippines. In February 2002, the Philippine Institute of Volcanology and Seismology (PHIVOLCS) reported sustained seismic activity that might lead to an explosion at Canlaon. PHIVOLCS noted an increase in seismic activity in Canlaon after five weeks of continuous and sustained earthquakes. During 27-28 February the Guintubdan seismic station detected at least 67 earthquakes, which was above the background seismic level of a few earthquakes per day. PHIVOLCS monitored both high- and low-frequency volcanic earthquakes at Canlaon; high-frequency events dominated, indicating that the volcano was undergoing possible magma intrusion. PHIVOLCS noted that such intrusions result in many high-frequency events intermixed with a few low-frequency earthquakes. The epicenters were detected over a large area, which could mean that a large body of magma was developing beneath the volcano. At this stage of activity, a major eruption was not anticipated because the earthquakes could also have been caused by rockslides along the volcano's faults. On 27 February trekking was banned within the 4-km danger zone after PHIVOLCS declared Alert Level 1 (the volcano is in a restive state, but trekking or any human activity could be dangerous within the danger zone). PHIVOLCS issued a statement that the area near the volcano should be avoided because of "possible sudden phreatic or steam-driven explosions." In the meantime, monitoring instruments were to be installed at the Guintubdan seismic station, located near the crater, to monitor the volcano's seismic activities. On 15 April PHIVOLCS concluded that the episodes of apparent seismic unrest at Canlaon could be traced to the Guintubdan and Mambucal areas. The Guintubdan area has been the site of earthquake swarms in the past, and these high-frequency events may be related to local fault movement and/or intrusions. On the other hand, earthquakes in the Mambucal area occurred when the Philippine National Oil Company (PNOC) pumped water into its geothermal wells and induced micro-earthquake fracturing at depth. In both instances, PHIVOLCS noted that significant earthquakes only occurred over a broad area N of the active crater of Canlaon, without distinct clustering or migration towards the crater. These observations suggest that earthquake activity, for now, is not related to a reactivation of the Canlaon magma system. With the return of seismic activity to baseline levels and having identified non-volcanic seismic sources in this area, PHIVOLCS lowered the alert status of Canlaon from Alert Level 1 to Alert level 0. However, visitors to the summit area were strongly urged to avoid entering the crater because sudden explosions may occur without warning. For the same reason, PHIVOLCS reminded the public that no permanent human activity is permitted within 4 km of the crater. The Philippine Institute for Volcanology and Seismology (PHIVOLCS) reported a sudden increase in steaming activity at Canlaon (also spelled Kanlaon) on 28 June 2002. At about 0436, "dirty white steam" was observed rising up to 200 m above the active crater and drifting SW and SSW. However, there was no corresponding significant earthquake activity; the seismic network detected only two high-frequency volcanic earthquakes in the 24-hour window around the event. A small ash puff on 28 November 2002 at 0721 rose ~100 m above the active crater and drifted SW. The event was recorded as a volcanic tremor at the Cabagnaan and Guintubdan seismic stations. Traces of ash deposits were observed at Cabagnaan Station, located SSW of the active crater. Moderate emission of white to dirty white steam was observed immediately after the ash puff. As of 1100 on 28 November, activity had decreased to only minor white steaming from the summit with a few discrete tremors. A PHIVOLCS report on 17 March indicated that the hazard status of Canlaon had been raised to Alert Level 1 following an ash emission on that day and one the previous week. At about 0530 on 17 March observatory personnel noted the emission of a grayish volcanic plume. The dirty white steam clouds rose 50 m above the active crater and drifted SW and SSW. No corresponding significant earthquake activity accompanied the event; the seismic network detected only two small low-frequency volcanic earthquakes in the preceding 24 hours. PHIVOLCS interpreted the activity as being hydrothermal in nature at shallow levels in the crater, with no indication of active magma intrusion. Details of the ash emission that occurred "last week" were not provided. Alert Level 1 signifies that there could be possible ash explosions in the coming days or weeks. For this reason, PHIVOLCS reiterated that the public should avoid entering the 4-km-radius Permanent Danger Zone. Information Contacts: Philippine Institute of Volcanology and Seismology (PHIVOLCS), Department of Science and Technology, PHIVOLCS Building, C.P. Garcia Avenue, University of the Philippines Campus, Diliman, Quezon City, Philippines (URL: http://www.phivolcs. dost.gov.ph/). Following an ash emission from Canlaon on 17 March 2003 (BGVN 28:03), the Philippine Institute of Volcanology and Seismology (PHIVOLCS) raised the hazard status to Alert Level 1 (on a scale of 0-5), which signified possible ash explosions in the coming days or weeks. There was another ash emission on 23 May. Beginning on 1 June, the seismic network detected an average of five low-frequency volcanic earthquakes per day. Moderate steaming was noted, which is unusual for Canlaon because steam is typically wispy or nonexistent during normal and quiet conditions. Brief bursts of ash and steam reaching 100 m above the active crater were observed on 1, 3, 4, 5, 6, 7, and 8 June. An ash emission during 0645-0700 on 8 June deposited traces of ash at Canlaon City proper and in the barangays of Masulog and Linutangan. Eight low-frequency volcanic earthquakes and four low-frequency short-duration harmonic tremors were recorded in the 24-hour period prior to the event. In addition, PHIVOLCS seismographs in Cabagnaan (6 km SW of the active crater) and Canlaon City (8.7 km SE) detected episodes of low-frequency tremor. Small ash ejections continued after 8 June. Ash-and-steam columns rose to 1,000 m before drifting SSE and SE. Ash explosions on 13 June between 0647 and 0756 were recorded at Cabagnaan as low-frequency short-duration harmonic tremors. The explosions produced voluminous dirty-white steam which rose to ~500 m and drifted SSE and ESE. Six low-frequency volcanic earthquakes and three low-frequency short-duration harmonic tremors were detected the 24 hours prior to the event. Two small steam-driven explosions occurred during 0820-0835 and 1020-1030 on 17 June. The ejected ash-and-steam columns rose to ~400 m above the summit crater and drifted NNE. In the 24-hour period prior to the explosions, the volcano's seismic network detected eight low-frequency volcanic earthquakes, two high-frequency volcanic earthquakes, and one low-frequency short-duration harmonic tremor. A mild ash ejection at 1422 on 18 June was recorded as a low-frequency volcanic earthquake. A grayish ash-and-steam cloud rose ~ 400 m above the summit crater before drifting SE. Only two low-frequency volcanic earthquakes and one short-duration harmonic tremor preceded the explosion. Mild ash explosions occurred during 0701-0707, 0743-0750, and 1420-1430. These explosions produced voluminous ash-and-steam clouds that rose 400 m above the summit crater before drifting NW. The events were reflected in seismic records as low-frequency volcanic earthquakes. In the 24-hour period prior to the events, two low-frequency earthquakes, one high-frequency volcanic earthquake, and one short-duration harmonic tremor were recorded by the seismic network. The volcano continued to manifest moderate steaming and ash emission activity with an ash column rising ~900 m above the summit crater at 0515 on 4 July. In the 24-hour period prior to the event the seismic network recorded five low-frequency volcanic earthquakes and two low-frequency short-duration harmonic tremors. The hazard status during June and July remained at Alert Level 1, and PHIVOLCS reminded the public to avoid entering the 4-km-radius Permanent Danger Zone. The absence of longer duration harmonic tremor suggested to PHIVOLCS that there was no magma movement or intrusion, indicating that the explosions were possibly a result of reactivation of a shallow hydrothermal system. Ash ejections were reported at Canlaon (also spelled Kanlaon) on 10 and 11 July 2003. At 1735 on 10 July a column of ash-laden steam, described as a moderate to strong dirty white color, was seen rising from the volcano to a height of 1 km by observers in Kanlaon City. The cloud drifted to the NW, SW, and NE, with an area within a 4-km radius from the crater affected by ashfall. The explosion registered as a low-frequency volcanic earthquake. Prior to this activity, two low-frequency volcanic earthquakes and two low-frequency short-duration harmonic tremors were recorded by the seismograph at Kanlaon Volcano Station. The phreatic activity continued as of 2000 that night. Two ash ejections were reported on 11 July, from 0620 to 0624 and 0658 to 0705. Dirty white steam rose up to 1.3 km above the crater and drifted to the SW. The seismic network recorded six low-frequency volcanic earthquakes and three low-frequency short-duration harmonic tremors. The alert status remained at Level 1 and PHIVOLCS reiterated its warning to the public not to venture within the 4 km radius Permanent Danger Zone. A report on 19 September 2003 from the Philippine Institute of Volcanology and Seismology (PHIVOLCS) summarized activity at Canlaon from 7 March to 23 July 2003. This included the ash ejections of 10 and 11 July (BGVN 28:07). There were 46 ash explosions recorded since March, characterized by emission of steam clouds with small amounts of ash rising 100-1,500 m above the active crater. Prevailing winds dispersed the ash mainly SW and SE, which settled predominantly over the mid-upper slopes of the volcano. Seismic activity remained elevated through this period, with epicenters of some high-frequency events located near the active crater, focal depths ranged from near-surface down to 18 km. From June to July, the numbers of recorded low-frequency volcanic earthquakes and low-frequency short-duration harmonic tremor events increased. This coincided with phreatic episodes between 8 June and 23 July 2003. On 23 July an ash explosion was observed from Kanlaon Volcano Observatory, 8.5 km ESE of the crater. Ash-laden steam clouds were ejected to heights of ~800 m above the active crater. After 23 July only weak steam emission was noted, and seismic activity returned to low levels. The Philippine Institute of Volcanology and Seismology (PHIVOLCS) noted in a March 2004 report that the most recent eruptive episode of Canlaon had begun on 7 March 2003. Their 2003 Annual Report described a mild ash-and-steam emission on 7 March that rose 1 km above the summit and resulted in traces of ash deposited at Cabagnaan, 5.5 km S. On 17 March 2003 the hazard status had been raised to Alert Level 1 (BGVN 28:03, 28:06, 28:07, and 28:08). A total of 46 minor ash ejections were documented or observed, most from June to July 2003, characterized by steam clouds with minor ash that rose as high as 1,500 m. Prevailing winds dispersed the ash over the mid-upper slopes in the SW and SE sectors of the volcano. Sporadic recordings of high-frequency volcanic earthquakes (HFVQ) and low-frequency volcanic earthquake swarms (LFVQ) starting in January 2003 prompted PHIVOLCS to issue a warning on the possibility of sudden phreatic explosions. In June 2003 daily occurrences of LFVQs increased dramatically and these heightened levels were sustained until July 2003. Low-frequency short-duration harmonic tremors (SDHLF) also appeared in June 2003 and increased like the LFVQs, indicating a continuous supply and transport of volcanic fluids towards the shallow levels of the crater area. A general trend towards volcanic quiet was recognized during August 2003, but the status was maintained at Alert Level 1 because HFVQs, LFVQs, and SDHLFs persisted, though in diminishing numbers, until September 2003. After that time, steam emissions from the summit crater were only weak or absent, with normal levels of seismic activity. On 1 March 2004 PHIVOLCS lowered the hazard status to Alert Level 0, meaning the volcano has returned to a quiet state. The public was strongly advised, however, to consider the risk when entering the 4-km Permanent Danger Zone because sudden phreatic explosions may occur without warning. People planning to climb the volcano are advised to check with an observatory first. Phreatic emission, January 2005. The value of continued warnings was shown on 21 January 2005, when Canlaon generated a sudden brief ash emission. The PHIVOLCS observatory at La Carlota City College reported moderate emission of a grayish volcanic plume at about 0930 that rose to ~ 500 m above the active crater and drifted WNW and SW, depositing light ash on the upper SW slopes. Traces of ash deposits were also observed at Cabagnaan, 5.5 km SW of the active crater. No coincident volcanic earthquakes were recorded, and Canlaon continued to be seismically quiet. These observations suggest the activity is hydrothermal in nature and occurring at very shallow levels near the crater floor. Ash emissions and sporadic seismicity at Canlaon between March 2003 and March 2004 were reported in BGVN 29:12. A brief ash emission began at Canlaon around 0930 on 21 January 2005. The eruption cloud rose ~ 500 m above the active crater and drifted WNW and SW. No coincident volcanic earthquakes were recorded. Fine ash was deposited in the city of Cabagnaan, ~ 5.5 km SW of the crater. The Philippine Institute of Volcanology and Seismology (PHIVOLCS) advised the public to avoid entering the 4-km-radius Permanent Danger Zone around Canlaon. Ash emissions began again on 20 March around 1300. Small amounts of ash fell in the town of Guintubdan 5 km W of the volcano. During 24 March to 4 April, sporadic ash emissions rose to a maximum of 1 km above the volcano. During this time ash fell in the towns of La Castellana (16 km SW of the crater), Upper Sag-ang, Yubo (5-6 km SW), and Guintubdan (5-6 km WNW). Due to this unrest, PHIVOLCS raised the Alert Level from 0 to 1 (on a scale of 0-5) on 30 March. According to a news article, pilots were advised to avoid flying near Canlaon. On March 22 the Provincial Disaster Management Team (PDMT) warned it would apprehend trekkers and faith healers who ventured to Mount Canlaon during Holy Week. Trekking to Mount Canlaon has become a practice by some faith healers and mountaineers who believe that the volcano is a source of supernatural powers. On 31 March at 0601 and 1715, two mild ash ejections reached heights of about 200-300 m above the summit before drifting NW and SW. Ash was deposited at Guintubdan, Upper Sag-ang, and Upper Mansalanao. A low-energy ash emission on 7 April at 1429 generated a cloud which rose to a height of ~ 100 m above the crater and drifted SW. According to PHIVOLCS, the seismic monitoring network around the volcano did not record any earthquakes during this event. During 13-14 April, mild ash emissions produced plumes to a height of ~ 700 m above the crater. During 15-17 April, moderate-to-strong emissions produced ash plumes to ~ 2 km above the crater and deposited ash in villages as far as La Castellana. None of these ash emissions was associated with seismicity, indicating that the activity is likely hydrothermal in nature, and taking place at shallow levels in the crater. Throughout this period Canlaon remained at Alert Level 1. As of the end of April 2005, the 4-km-radius Permanent Danger Zone (PDZ) was restricted and all treks to the summit remained suspended. Information Contacts: Philippine Institute of Volcanology and Seismology (PHIVOLCS), Department of Science and Technology, PHIVOLCS Building, C.P. Garcia Avenue, Univ. of the Philippines Campus, Diliman, Quezon City, Philippines (URL: http://www.phivolcs.dost.gov.ph/); Chris Newhall, USGS, Box 351310, University of Washington, Seattle, WA 98195-1310, USA; Philippine Star (URL: http://www.philstar.com/). 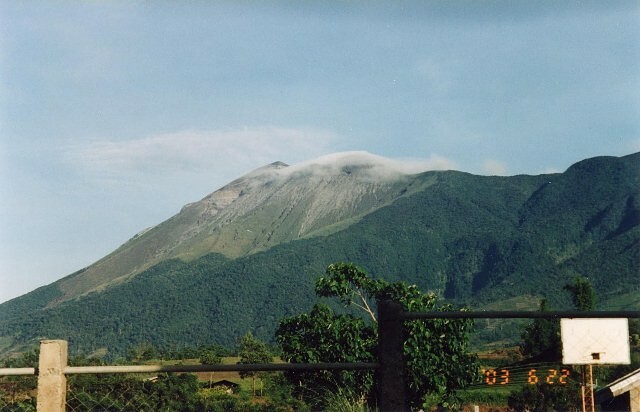 Throughout May 2005, PHIVOLCS noted that ash-and-steam emissions from Canlaon produced plumes to 500-1,000 m above the volcano. The hazard status remained at Alert Level 1. The SO2 flux remained above the 'normal' level of 500 metric tons/day (t/d) with values of 2,700 t/d on 1 May, 2,080 on 22 May, and 1,400 on 26 May. According to news reports, flights to and from nearby Kalibo airport were suspended on 3 May due to reduced visibility. Although voluminous white steam continued to be discharged from the active vent early in June 2005, after 25 May ash ejections stopped and ash contents in the steam plume were significantly reduced. On [30 June] PHIVOLCS lowered the hazard status of Canlaon from Alert Level 1 to Alert Level Zero, listing a variety of reasons. For one, they noted the downtrend in the SO2 gas emission rate from a high of about 4,900 t/d, to the prevailing level of 1,500 t/d. For another, they noted the absence of significant seismic activity before, during, and after the ash emissions. And finally, they cited a lack of significant observations indicating near-surface hydrothermal activity. Since Canlaon has a history of sudden outbursts, the public was reminded to refrain from entering the 4-km-radius Permanent Danger Zone (PDZ) and to coordinate with PHIVOLCS and Disaster Management Councils in any attempt to climb the volcano. After a year of quiet following ash ejections from Canlaon in May 2005 (BGVN 30:06), the Philippine Institute of Volcanology and Seismology (PHIVOLCS) reported that a new period of activity began on 3 June 2006. In total, twenty-three ash ejections occurred between 3 June and 25 July 2006. These outbursts were all water-driven in nature, characterized by emission of ash and steam that rose up to 2 km above the active crater. The prevailing winds dispersed ash in all directions. The seismic network, however, did not detect significant seismic activity before or after the ash emissions, supporting the idea that the explosions were very near-surface hydrothermal events. Four explosive episodes that occurred over the days 3, 10, and 12 June ejected mainly steam with some ash, and affected only the summit crater and upper SW slopes. The event at 1430 on 3 June sent dirty white to grayish steam 800 m above the summit. The activity was observed until 1445 when thick clouds covered the summit. Another emission started at 2316 on 10 June and lasted until 0030 the next morning. The plume was estimated to attain heights of 700-1,000 m before drifting SW. After the ash emission, moderate to wispy steam plumes escaped, to maximum heights of 600 m above the summit. Another steam-and-ash episode during 0515-0535 on 12 June caused a plume to rise about 600 m before drifting SW. After the ash emission, generally weak to moderate steaming to a height of ~ 400 m returned. Plumes rose 600-1,000 m and drifted SW; ashfall was confined to the upper slopes. This new period of low-level unrest prompted PHIVOLCS to raise the hazard status to Alert Level 1 on 12 June, suspending all visits to within 4 km of the summit. Three small steam-and-ash emissions without recorded seismicity occurred again between the afternoon of 13 June and the morning of the 14th. The grayish steam clouds rose ~ 900 m above the active crater and drifted NE and NW. Only traces of ash were observed over the N upper slope. An explosion from 0845 to 0924 on 14 June produced an ash and steam cloud, which rose up to 1.5 km above the summit and drifted N, affecting mainly the upper slopes. Voluminous grayish steam plumes were then seen rising up to 1.5 km above the summit crater after 1640 through the next morning. The seismic network detected only two low-frequency volcanic earthquakes. Kanlaon City proper experienced light ashfall starting at 1630 on 15 June after voluminous dirty white steam was observed rising 1.5-2 km above the summit crater a few hours earlier (from 1346 to 1520). As of 1800, ashfall was still wafting through the city. The character of this episode changed on the afternoon of 19 June when two episodes of steam-and-ash emission sent clouds 600 m above the crater that drifted SW. Weak to moderate steaming was observed after the second explosion and during the morning observation on the 20th. The initial explosion was recorded by the Cabagnaan station's seismograph as low-frequency tremor with a duration of 13 minutes. One minute of tremor was recorded at the time of the second explosion. No precursor seismicity was detected. Traces of ashfall and sulfurous odors were reported at Barangay Cabagnaan proper in La Castellana. During the 24 hours before 0730 on 20 June, the seismic network detected two cases of low-frequency tremor and three small low-frequency volcanic earthquakes. An additional six short steam-and-ash emissions took place during 21-25 June. The explosions produced grayish columns that rose 800-1,500 m above the crater and drifted NW, SW, and SSW. Volcanic seismicity was not associated with these events except for a single harmonic tremor before the emission on 25 June. Light ashfall was reported at Upper Cabagnaan in La Castellana. Weak to moderate steaming was observed after the explosions. Steam-and-ash emissions were not reported again until the afternoon of 2 July. The grayish steam clouds then rose to heights of up to 1,000 m above the active crater and generally drifted NW. Another episode on the morning of 3 July produced a column to a height of 500 m above the crater. The seismograph at Cabagnaan recorded ten volcanic earthquakes while the seismograph at Sto. Bama near Guintubdan in La Carlota City recorded eight local seismic events during the 24 hour observation period that included these emissions. An explosion-type earthquake with a 10 min, 25 sec duration was recorded at 0426 on 23 July, but cloud cover prevented observations. Traces of ash fell up to about 9 km ENE from the crater, affecting Barangays Pula, Malaiba, and Lumapao. When clouds cleared during 0630-0800 on 25 July, ash-laden steam clouds were seen rising up to 300 m above the crater drifting ENE and SE. Light ashfall was experienced at Gabok, Malaiba, and Lumapao of Kanlaon City, about 9 km from the crater. This emission was not reflected on the seismic record as only two small volcanic earthquakes were detected during the preceding 24 hours. Dirty white steam was observed on the morning of the 26th rising to a maximum of 100 m above the crater. Explosions ceased after 25 July, and other activity, such as weak steaming and minor seismicity, showed a general trend towards quiescence. After three months with no further explosive emissions, on 2 November 2006 PHIVOLCS lowered the hazard status from Alert Level 1 to Alert Level 0, meaning the volcano has returned to normal conditions. According to the Philippine Institute of Volcanology and Seismology (PHIVOLCS), after an ash explosion at Kanlaon on 23 July 2006 and a series of earthquakes the day after (BGVN 32:02), activity subsided. Only non-eruptive activity was reported between the 2006 explosion and 24 November 2015, when ash emission began following strong seismicity and steam explosions the day before; intermittent ash emissions continued through 30 December. Activity resumed briefly with explosions and ash plumes during 29-31 March 2016. Reports during 2008-2010. During 26 July-2 November 2006, no ash explosions occurred, and both steam emissions and seismicity were low, prompting PHIVOLCS to lower the Alert Level from 1 to 0 (out of 5). PHIVOLCS reported that during 7-10 February 2008, the seismic network detected a significant rise in earthquakes, prompting them to raise the Alert Level from 0 to 1 on 10 February. Cloud cover prohibited visual observations of the summit. According to a news account (Sun Star News), seismic activity returned to background levels during 5 March-25 April (0-3 earthquakes/day), persuading PHIVOLCS to lower the Alert Level to 0 on 25 April 2008. During 23 August-1 September 2009 the PHIVOLCS seismic network detected a significant rise in the number of earthquakes. A few of the earthquakes were felt as far away as Bago City, 30 km NW. The epicenters clustered on the NW flank. Based on a pilot observation, the Tokyo Volcanic Ash Advisory Center (VAAC) reported that on 15 May 2010 an ash plume rose to an altitude of 2.4 km and drifted W. Ash was not identified in satellite imagery. PHIVOLCS later confirmed that the plume originated from a fire and not an eruption. No further reports were issue by PHIVOLCS until November 2015. Activity during November-December 2015. At 0930 on 23 November 2015 the seismic network detected an explosion-type signal, culminating with an 8-minute-long steam explosion. Observers reported that a white plume rose 1-1.5 km above the crater and drifted SW, and rumbling was heard in local areas. Only four volcanic earthquakes had been recorded during the previous week, but after the explosion, the network detected volcanic tremor that lasted for five hours. The Alert Level was raised to 1. Continuous steam emissions with minor ash content were observed the next morning. During 24-25 November, the seismic network detected 11 volcanic earthquakes; on 25 November, gas-and-ash emissions rose 150 m above the crater and drifted SW. According to PHIVOLCS, two volcanic earthquakes accompanied by a one-minute, low-energy, gray ash emission occurred at 0513 on 11 December 2015. Observers also noted ash emissions at 0951, 1008, 1140, and 0101 on 13 December that rose 200-300 m and drifted SW. The emissions were not detected by the seismic network, indicating a shallow source. Trace amounts of ashfall were reported in nearby communities on the W and SW flanks. At 2138 on 15 December a low-frequency earthquake lasted 45-47 seconds. Inclement weather prevented visual observations of the crater. Rumbling was heard in neighborhoods on the SE flank. On 17 December white steam plumes rose 50 m above the crater. Poor weather conditions prevented further views of the crater through 22 December. PHIVOLCS reported that at 1457 on 23 December 2015, the seismic network detected an explosion. The event was not visually observed due to dense weather clouds around the summit area, but rumbling was heard in nearby barangays (villages) including Cabagnaan, La Castellana (16 km SW), and Ara-al and Yubo, La Carlota City (14 km W). Minor amounts of ash fell in Ara-al, Haguimit, and La Granja, La Carlota City, and a sulfur odor was noted in barangay Tres Elis, La Castellana. Another explosive event was detected at 2109 on 24 December, but was again not visually observed. Trace amounts of ash fell in Ara-al, Haguimit, and La Granja, and a sulfur odor was reported in Tres Elis. On 26 December, white steam plumes rose 100 m above the crater and drifted SW. A five-minute long ash event that began at 1329 on 27 December was accompanied by rumbling heard in a few local barangays. An eruption plume, viewed from the SE flank, rose 1 km above the crater, and may have risen as high as 4.5 km based on pilot observations. Minor ashfall was noted in nearby communities as far as 58 km WNW. About 1230 on 30 December, a low-energy explosion produced an ash plume that rose 100 m above the crater and slowly drifted SW.
Activity during March-April 2016. According to PHIVOLCS, at 1820 on 29 March 2016, the seismic network detected a 12-minute explosion that was accompanied by a booming sound heard in nearby communities. Observers to the SE reported an ash plume that rose 1.5 km above the crater, and minor amounts of ash fell in areas downwind. Incandescent ejecta caused a small fire on the upper flank. A 25-second-long explosion was detected at 1918. On 30 March at 0130, a long-duration tremor began that was accompanied by gas-and-steam plumes that rose 600-700 m and drifted SW and SSW. On 31 March 2016, minor ashfall was reported in areas downwind, including in parts of La Carlota City (14 km W), La Castellana, and Bago City in Negros Occidental. The tremor continued during 2-4 April, though the energy decreased, and steam plumes rose 400-500 m. On 5 April steam plumes rose 800 m and drifted SW. The Alert Level remained at 1. Information Contacts: Philippine Institute of Volcanology and Seismology (PHIVOLCS), Department of Science and Technology, PHIVOLCS Building, C.P. Garcia Avenue, Univ. of the Philippines Campus, Diliman, Quezon City, Philippines (URL: http://www.phivolcs.dost.gov.ph/); Tokyo Volcanic Ash Advisory Center (VAAC), Tokyo, Japan (URL: http://ds.data.jma.go.jp/svd/vaac/data/); Sun Star News (URL: http://www.sunstar.com.ph/); The Manila Times (URL: http://www.manilatimes.net/). An ash explosion from Kanlaon on 24 November 2015 was the start of activity that included intermittent ash emissions through December and during 29-31 March 2016 (BGVN: 4014). That activity was followed by decreasing tremor and steam plumes rising to as high as 800 during the first days of April 2016. A short series of explosions on 18 June 2016 were the last ash emissions through 2016, based on Philippine Institute of Volcanology and Seismology (PHIVOLCS) reports. The Alert Level remained at 1 (on a scale of 0-5) throughout the reporting period, indicating low level of volcanic unrest. PHIVOLCS reported that ground deformation measurements from continuous GPS data as of 2 June 2016 indicated slight inflation of the edifice since December 2015. Weak to moderate emission of white steam plumes that rose 540 m during 15-17 June and drifted SW and NW. A series of three eruptive events occurred on 18 June, beginning at 0919 and lasting 27 minutes. These events were recorded by the seismic monitoring network as consecutive explosion-type earthquakes that lasted 30, 42, and 29 seconds, respectively. The first event, a steam-and-gas explosion, generated a light gray-to-white ash plume that initially rose 1.5 km above the crater and then later to 3 km (figure 3). The second event, an ash eruption immediately following the first event, produced a dense black ash plume that rose 500 m. Lastly, a grayish ash plume rose 500 m. Minor ashfall was reported to the W in the barangays of Ara-al, San Miguel, and Yubo in La Carlota City (14 km W), Sag-ang in La Castellana (16 km SW), and Ilijan in Bago City (30 km NW). A diffuse sulfur odor was detected in Ara-al. Figure 3. Photo sequence showing eruption plumes from Kanlaon at 0919 on 18 June 2016. Courtesy PHIVOLCS. PHIVOLCS reported that during 20, 22-23, and 25-26 June white steam plumes rose as high as 800 m and drifted WNW, NW and SW; wispy steam plumes were observed on 27 June. Starting at 1640 on 23 June the seismic network recorded a 4-minute-long, explosion-type signal; weather clouds prevented visual observations of the summit area. White plumes were again seen during 20-25 July. On 20 July plumes were a dirty-white color; on 21-22 they were of white steam; and on 25 July they rose 200 m and drifted NW and SW. Sulfur dioxide (SO2) emitted at the active vent averaged 234 tonnes/day on 21 July. Ground deformation data from continuous GPS measurements as of 3 September 2016 indicated no significant change of the edifice since August 2016. Kanlaon volcano (also spelled Canlaon), the most active of the central Philippines, forms the highest point on the island of Negros. The massive andesitic stratovolcano is dotted with fissure-controlled pyroclastic cones and craters, many of which are filled by lakes. The largest debris avalanche known in the Philippines traveled 33 km SW from Kanlaon. The summit contains a 2-km-wide, elongated northern caldera with a crater lake and a smaller, but higher, historically active vent, Lugud crater, to the south. Historical eruptions, recorded since 1866, have typically consisted of phreatic explosions of small-to-moderate size that produce minor ashfalls near the volcano. von Biedersee H, Pichler H, 1995. The Canlaon and its neighbouring volcanoes in the Negros Belt/Philippines. J Southeast Asian Earth Sci, 11: 111-123. There is no Deformation History data available for Kanlaon. The barren summit of Canlaon volcano (also spelled Kanlaon), the most active volcano of the central Philippines and the highest point on the island of Negros, lies at the southern end of the summit ridge and overlooks a 15 sq km elongated caldera to the north. Five major vents are aligned NNE within the smaller active crater. Historical eruptions, recorded since 1866, have typically consisted of phreatic explosions of small-to-moderate size that produce minor ashfalls near the volcano. NASA Landsat image, 2003 (courtesy of Hawaii Synergy Project, Univ. of Hawaii Institute of Geophysics & Planetology). Weather clouds drape the sparsely vegetated summit of Kanlaon volcano (also spelled Canlaon). Kanlaon is the most active of the central Philippines and forms the highest point on the island of Negros. The massive 2435-m-high stratovolcano is dotted with fissure-controlled pyroclastic cones and craters, many of which are filled by lakes. Historical eruptions, recorded since 1866, have typically consisted of phreatic explosions of small-to-moderate size that produce minor ashfalls near the volcano. There are no samples for Kanlaon in the Smithsonian's NMNH Department of Mineral Sciences Rock and Ore collection. Large Eruptions of Kanlaon Information about large Quaternary eruptions (VEI >= 4) is cataloged in the Large Magnitude Explosive Volcanic Eruptions (LaMEVE) database of the Volcano Global Risk Identification and Analysis Project (VOGRIPA).